The oak Aston roomfold range is one of our up and coming door sets which is getting more and more popular by the month. 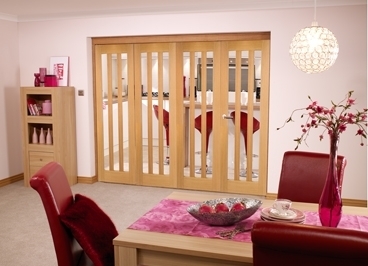 Featuring three narrow glazed panels per door, these doors will cut a striking silhouette in any home. If you’re keen to get a taste of open plan living but would also like the flexibility of being able to open up, and section off, your home as and when you please, then these interior bifold doors are the perfect compromise. When you open the doors, they fold away neatly to maximise your available space. When closed, the glazed panels still allow light to filter from room to room, whilst creating a sense of privacy and seclusion. The Aston roomfold door systems that are on this page are supplied unfinished, allowing you the opportunity to finish them with your choice of stain, paint or varnish prior to installation. To find out more about the construction of these doors, simply click on a configuration below to discover technical specifications and more. If you require any assistance or help in choosing the right configuration for your home, or you’d just like to chat to someone about your options, please do get in touch with our team. Our knowledgeable staff will be more than happy to answer any questions or queries you may have.